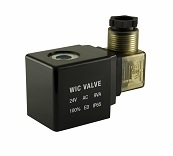 WIC Valve 2PCZ Series 2-way normally closed anti corrosion solenoid process valve is to control On/Off of air, inert gas, liquid, acid, alkali and salt water. The 2PCZ series electric valve equips with the low power consumption continuous duty encapsulated coil that provide energy savings, reliability and performance.This anti-corrosion solenoid valve has one 3/4" Inch NPT inlet and one 3/4" inch NPT outlet port. 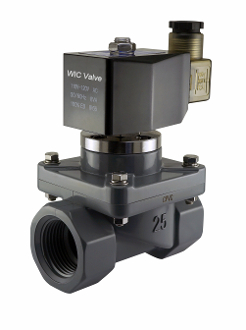 Valve stays close when the coil is de-energized, and it opens when energized. Our unique piston design allows the fluid completely separate with the valve metal components. No corrosive fluid contacts the metal parts. 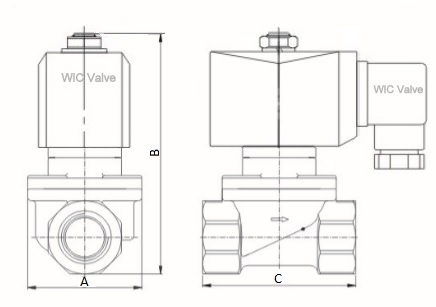 2PCZ Series acid resistant solenoid valve can be mounted in any position. CPVC stands for Chlorinated polyvinyl chloride. It is a thermoplastic produced by chlorination of polyvinyl chloride (PVC) resin. CPVC is altered by a free radical chlorination reaction that effectively increases the chlorine content of the material that can withstand higher temperatures than standard PVC. The key advantages of CPVC material is that it resistance to a large range of acidic and caustic chemicals. Such as most of the acids, bases, salts and board range of organic media, within certain limits of concentration and temperature. CPVC is commonly use for hot and cold water applications and industrial liquid handling.